Taking part in Saturday's landrover pull. The weekend's chilly weather failed to discourage members of Carrick Rangers FC Academy as they took part in a charity landrover pull through the town. The event on Saturday saw young players from the 2011 squad raise £475 for AA Veterans Support. The event raised funds for AA Veterans Support. Set up in 2011 by MLA and former soldier Andy Allen, the charity works to provide respite, treatment, training and welfare assistance to service and ex-service personnel. The landrover pull was supported by local councillor, Noel Jordan with Dobbins Inn providing food and refreshments for the young participants. 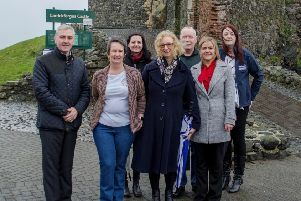 Organisers expressed their gratitude to the people of Carrickfergus for their generosity. Meanwhile, parents of the team members have thanked Peter and Vicki Owens, along with coaches Gee and Robbie for all their hard work throughout the year. Andy Allen with Dylan Owens.